From the cover of Dark Threats and White Nights. During the "Somalia Affair," Canadian soldiers captured and tortured Somalis from Belet Huen. The revelations came as a shock to Canadians accustomed to a steady image of armed forces dedicated to benevolent and competent "peacekeeping." Canada's "national mythology" is a central focus in Sherene Razack's study of the official response to the "Somalia Affair." 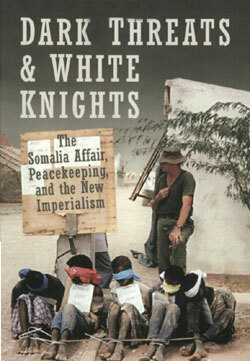 The result was her 2004 book Dark Threats and White Nights: The Somalia Affair, Peacekeeping, and the New Imperialism. Razack writes that with the exposure of torture by Canadian soldiers, "modern peacekeeping revealed its sordid colonial origins. Soldiers had acted more like conquerors than humanitarians." In response, Canadian officials instituted a Commission of Inquiry. The Canadian government, however, shut down the Commission, before it could fully investigate the murders or the potential complicity of military leaders in these acts. What the Commission did have time to convey was closer in form to an acquittal. In the opening lines of its report, the Commission said that "The soldiers, with some notable exceptions, did their best. But ill-prepared and rudderless, they fell invariably into the mire that became the Somalia debacle. As a result, a proud legacy was dishonoured...the leadership errors in the Somalia mission were manifold and fundamental." Despite this acknowledgement, the Commission stopped short of holding specific leaders accountable, while maintaining that the troops were not to blame for the torture and murder they committed. Media reports, says Razack, were "reporting with sympathy the animosity Canadian soldiers were feeling towards rock-throwing Somalis" long after Arone's murder. "Many soldiers say privately they wish they could shoot more often," Paul Watson reported in the Toronto Star in a story describing the "rough life" of the soldiers in Belet Huen. But it wasn't as though the media were not interested in the "Somalia Affair" as a scandal. Razack asks us to look at the particular kind of attention that it was paid, however; the violence against Somalis didn't interest the media, but the "cover-up of that violence by the military did." Canadians "believe we were duped by our own, and that it was our very niceness and national naivete that led to the debacle in Somalia." Even though Canada was clearly responsible for the killings, what the media and the government chose to focus most on was a "nice" Canadian character that had been tainted by a few rogue soldiers. On Razack's account, Canada has integrated the "Somalia Affair" into its national understanding in a narcissistic fashion. To recap, violent acts of an inarguably and fundamentally racist character were committed and six human beings were killed and several more were tortured. But to the Commission--as was the dominant public interpretation--it was Canada that had been betrayed. This betrayal, however, was committed by an anonymous institution, conspiring with the "mire" of Somalia, which was never held accountable, either for its murder and torture or for its betrayal of Canadian self-perception. Racism slid out the back door of Canada's collective interpretation. Heroism took its place. "The hold that mythologies have should not be underestimated," writes Razack. "They have the power to make a nation replace tortured and dead bodies with traumatized soldiers." The prevailing account stressed that "our mythological virtues as a nation that is somehow too gentle, too bureaucratic, and too given to navel-gazing," Razack argues, "enabled us to look at racism in the Somalia Affair and still not really see it." It is the mythology itself, Canadian identity, which acted to enable the conclusion that the racist torture and murder committed by members of the airborne division was exceptional. In fact, several witnesses suggested to the Inquiry that if there were racists in the military, it was unlikely to be a number higher than existed in "Canadian society as a whole." What, Razack asks, does Canadian identity mean in terms of self? "A Canadian knows herself or himself as... a modest, self-deprecating individual who is able to gently teach Third World Others about civility." At bottom, she argues, this is a fundamentally colonial mindset that renders "any sort of personhood" of those being taught "inconceivable." At home, Canada's mythology covers over 200 years of remarkably frank attempts to eliminate the existence of the country's original inhabitants, a fact that in part explains the sophistication and deep-rootedness of the mythology in the relatively new context of "peacekeeping." Dark Threats and White Knights offers an in-depth and subtle analysis of the mentality of a nation that wants to "weep and to collectively remember, but...not to probe too deeply into the difference between looking on and direct suffering." In essence, Razack provides an extensive inventory of the colonial mindset that the Canadian public has not yet recognized or begun to address. The book's concluding sentence enjoins us to "look critically at who we are." To bring Razack's injunction to bear on ongoing Canadian interventions abroad means to insist, first of all, that Canada's identity--as a peacekeeper, as well-meaning, or as nice-- not be allowed to supersede what Canada is in fact doing abroad. Only by holding mythology at bay can we begin to form a critical understanding of ourselves.